Aubrey W. Pridgen, Lieutenant Colonel, born Feb. 3, 1925, Snow Hill, NC. He entered the USN March 27, 1944 and received basic training at Camp Peary, VA. He was assigned to the West Virginia (F Div.) and was aboard for all WWII campaigns after the West Virginia was rebuilt. Campaigns included Leyte Gulf, Suriago Strait, Mindoro, Luzon, Iwo Jima and Okinawa. He was aboard during the signing of the surrender in Tokyo Bay Sept. 2, 1945. 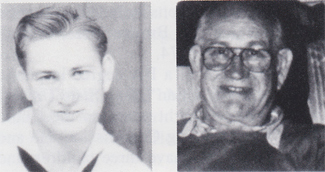 Aubrey was discharged from the USN with rate FC2/c on May 2, 1946. He continued formal education by attending East Carolina University where he received BS and MA degrees. He was a teacher and principal in North Carolina schools, 1950-56. In January 1957 he began a second military career which continued for 25 years. He retired from the USAF with a rank of lieutenant colonel in 1982. He was awarded 12 citations, decorations and medals during his military service with the USN and USAF. Aubrey and his wife, Annetta, have four children and two grandchildren.